The four domain providers of EIG – Domain.com, Netfirms, Dotster and MyDomain suddenly reduce the price of .COM and .NET domain names AGAIN, just $3.99/year. Each .COM or .NET at those providers costs only $3.99 for the first year registration and you can buy as many domains as you want. 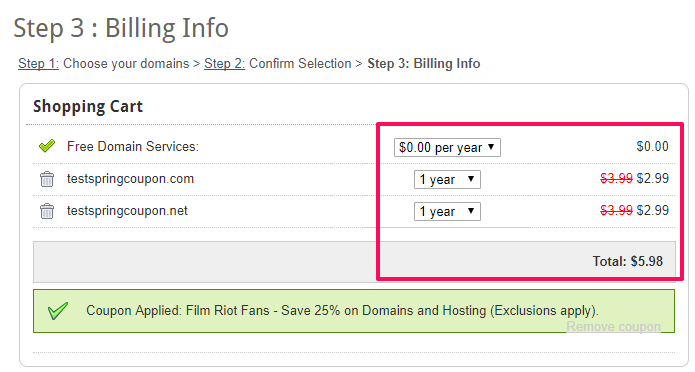 Moreover, when registering at Domain.com, use the 25% OFF coupon – FilmRiot to reduce more, the price now is at $2.99/year. Unfortunately, the rate is not applied for transfers and renewals. ***Paypal and Credit Card are both available. Promo price is valid for the first year registration only. Unlimited domains. For the best saving, in my opinion, you should choose the lowest renewal price provider, that’ll save you much better for the next year. It’s such a long time that those providers have such a good domain discount program, let take advantage of this chance. The offer will end very soon – normally in a few hours. If you want to transfer domains, LCN is offering just $6.25 for .COM and NET transferring. I came by your site and got your post. Luckily I got some .NETs just on time! Thanks for visiting Spring Coupon, hope you enjoy! The Sale20 doesnt work on Netfirms? What a confusing situation, lol. You should live chat to ask for the reason, I think. 1:42:53 PM Vishal U I will check. 1:44:30 PM Vishal U You have to first remove the domains from FatCow account. Do you want me to remove the domains? 1:44:48 PM vijay kudal but will it remove hosting? 1:45:46 PM Vishal U Yes, hosting will not work if you remove the domain. 1:50:37 PM Vishal U In order to host the website, domain needs to be associated with the account. Tks. My small business gonna come out soon. .NET doesn’t often have as cheap price as this time. I meant that, bro. You can transfer to Netfirms with this promotion. Can not transfer to Netfirms. anyone has the same problem? Hope they will let the $0.99 and $1.99 domain deals back soon. Managed to grab a few, thank you! Just an update, the promo is again back! $1.99 per .com and .net. “GOBIG” coupon for additional discount. At Doster, it shows “invalid coupon” for me too, with code GOBIG when transferring. New registration still ok. I suggest you use MONDO or MAMMOTH to save 30%. If it not works try NVU to save 15% off. New 20% off coupon – TODAY20. Sale ends tonight at 11:59 p.m. Pacific. Please help, how do i transfer my Domain Name for only $ 1.99 ? You can only transfer .COM domain to Netfirms to get the $1.99 price. Then transfer in Domain Control Panel.Please read the note in the red box in the post to get more detail. if someone can use this promotion please tell me. Guys, it’s ON now but only for new registrations. Act fast, please! How can I transfer my domain with $1.99 ? is this for unlimited years? current promo is for unlimited domains? Too bad transfers aren’t available on this current promotion. I have lost that deal. Dear can I buy unlimited .com domain with domain.com by coupon code “FilmRiot” in one account ? This promotion is over ? Yes it’s now over. Did you get some?